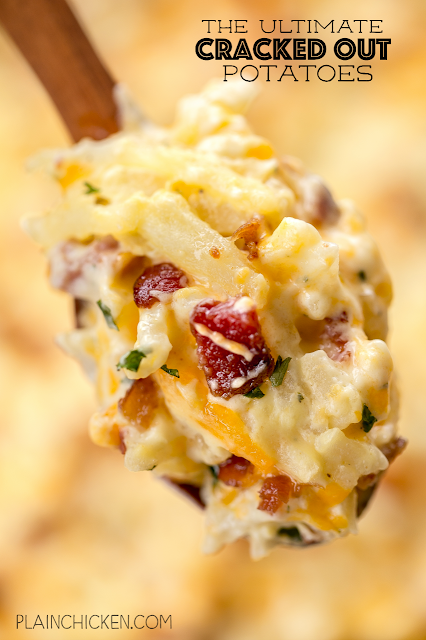 THE ULTIMATE Cracked Out Potatoes - cheddar, bacon and ranch. SO addictive!! I could make a meal out of this potato casserole!! Cheddar, bacon, ranch, cream of chicken soup. sour cream, frozen shredded hash browns. Can freeze for later. We usually bake half and freeze half for later. SO GOOD! 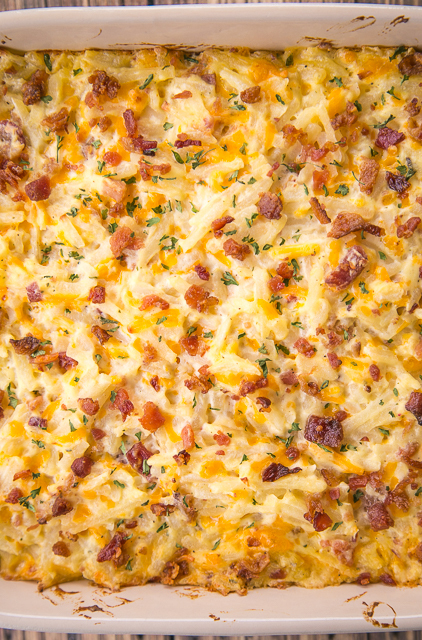 Our Crack Potato Casserole is one of our all-time favorite side dishes. It is so simple and tastes incredible! The recipe was created by accident. We forgot to take our Crack Dip to the tailgate and I ended up making a potato casserole with the dip. It is one of our favorite recipes. I love happy accidents!! This recipe is an updated version of the original recipe. We really think these are THE ULTIMATE Cracked Out Potatoes!! Cheddar, Bacon, Ranch, cream of chicken, sour cream and hash browns. CRAZY good! They are so creamy and full of AMAZING flavor!! I could seriously make a meal out of just these potatoes. They are my absolute favorite!!! This makes a lot of potatoes. I usually split the recipe between 3 or 4 small foil pans and freeze the extra pans for later. I actually have 2 pans of this potato casserole in the freezer right now! To bake the frozen potatoes, I let the pan thaw in the refrigerator all day and then bake them. You can bake them frozen, you will just need to add more time to the cooking time. I might cover them for a little while also if putting the pan in the oven completely frozen. Preheat oven to 400º F. Lightly spray a 9x13-inch pan with cooking spray. Set aside. Looks delicious and love your first shot. Do the hashbrowns need to be thawed or do you mix them while they are frozen? I usually just mix them up frozen, but thawed is fine too. Oh boy do those cracked out potatoes look amazing or what! There is something I have some precooked chopped bacon in my freezer already...I am thinking I need to make these! Have you every made these in a slow cooker. If so how long did you cook them? She has a very similar recipe for Crock Pot Cheesy Potatoes we make all the time...takes 4 to 6 hours on Low and can be doubled for a crowd!!! Oh my GOSH! This casserole is delicious! I made it last night. It's hard to stop eating it! I added organic green onions (diced) to mine and also a teaspoon of black pepper. Out of this world! Thanks so much!! I took a risk and made this on a whim for the company holiday luncheon yesterday. I've never made it before but figured how can you go wrong with those ingredients? I mixed everything together the night before and popped it in the oven yesterday morning while I was getting ready for work. It was the biggest hit! Everyone raved about it, there weren't any leftovers, and several people asked for the recipe. It was even unofficially discussed as a "best side dish" (tied with a coworkers delish sweet potatoes). Thanks for the home run recipe. 1/13/2018: I made this to go along with Lobster and it was a real treat... everyone loved it. When things like, "it's a keeper" and "can I get that recipe?" are things people say, you know you have a winner. Thanks for sharing! Do i use the ranch dressing mix that goes in sour cream or the vinaigrette type? This was great! Im making it again. Would love to make this for a large bbq I’m having next weekend. Should be about 40-50 people there... do you think I could/should triple this? Bad at estimating things. I would make 4 or 5 pans. I figure 10 people per pan. Hi. Do you use frozen or refrigerated hash browns? Thank you! Would it be ok to substitute the hasbrowns with cubbed potatoes? I forgot my hasbrowns at home!and would I need to increase the cook time? Can this be reheated in a crockpot for a potluck? In the pictures ~ it almost looks like Ritz crackers are in it...did you garnish with those? Can't wait to try this one! There aren't any Ritz crackers in this recipe. You can certainly add some on top if you desire. How many people does the current recipe serve?